Warning: This post is a book review with a huge spoiler. Why am I even surprised anymore at how often I start reading a novel, and it turns out to be about autism in some way. Really, I should just do shots. Or make bingo cards. My latest read was a good one, and I cannot stop reflecting on it. It’s “The Bookseller” by Cynthia Swanson. It was her first novel, and the reason I borrowed it was because I had read her super creepy thriller “The Glass Forest” recently, and was amazed at how she places women’s internal lives so accurately in the world. I wanted to cozy up to more of her brilliant mental workings. If I am being honest, when I first encountered the autistic character in “The Bookseller,” I scoffed out loud. I cannot anymore with using autism as a truthtelling mechanism; it’s just a bit too easy, and also very tokenizing of disability. And in some ways, I will say she did fall into that trap. More about that later. But in terms of how she captured the child’s mother’s journey, she left me feeling like I had walked onto a stage without meaning to, and was standing, stunned and unprepared, in a huge spotlight, while a crowd of strangers stared right into my heart and saw every vessel pulsing its secrets out into the public forum. We first meet Kitty Miller in Denver of the 1960s when she starts having a very vivid dream life. In her dreams, she is Katharyn Andersson, in a suburb of Denver, wife of Lars, mother of beautiful twins, a boy named Mitch and a girl named Missy. Kitty cannot understand why she is having these visions of a life she never sought; in her real life, she is in her late 30s, happily single, and co-owner of a well curated but increasingly insolvent bookstore with her dearest friend, Frieda. Her parents are away in Hawaii, and we get to know her mother through the frequent postcards she writes to Kitty. The missives are filled with longing to be back home, and we get a sense of how entwined the family’s affections are, in a wonderfully uncomplicated way. Neither Kitty nor Frieda seems interested in dating, though Kitty did once place an ad in the personals page, and Lars answered it. They talked with great purpose and excitement once on the phone, but he never showed up for their coffee date, and that was that. Tormented by why she is dreaming of this fictitious life with Lars, Kitty starts to hunt down some clues in real life. She discovers through a newspaper archives search, and also a benevolent but still peculiar stalking of Lars’s sister, that Lars died of a heart attack right after she spoke to him on the phone. In her dreams, however, the explanation is that Lars started to go into cardiac arrest as Kitty was talking to him, so she was able to get him medical help, and he survived. This is how they met and married, and Lars, a professional architect, goes on to build a house for their family. In Swanson’s books, one of the prevailing metaphors is men either building homes for their wives, or women refusing such offers. Either way, the image of wanting to house one’s beloved is something she uses very effectively, to show, not only how safety is constructed in a trusting relationship, but also how, when women begin to disconnect in their heads because of emotional trauma, no four walls can contain their wandering spirits. Slowly we are introduced to Michael, who is Katharyn’s third child. She is the dream-mother of triplets, and Michael has autism. That factoid seems random to the reader, and in that way that sometimes traps writers, they are forced to make the character only “intermittently autistic” because, otherwise, how would they speak the noble truths in the role of mouthpiece that autists get saddled with in order to center neurotypicals, and teach us how to view the world differently. AIYYOH. If I am being overly harsh, I cannot find it in myself to apologize. My kid is autistic 24/7. Any insights that work their way out of me are born of my own fevered imagination, out of my own urgent wish to create meaning. He does not type out quotes from Eckhart Tolle in order to illuminate my path. SPOILER ALERT. If you are planning to read this book, stop here, because I am going to reveal the plot’s big secret….. The dream life where Katharyn is married to Lars is actually her real life, and the imagined one is her single life as Kitty. She did once own a bookstore with Frieda, but that ended when she discovered that her nanny was abusing Michael, so she abandoned her career to stay home with him. Why does Katharyn construct such an elaborate alternate world? Why does anyone? Because the material reality in front of her has become intolerable. Trapped in the intellectual cage of autism caregiving, her friendship with Frieda in ruins after she fled the sinking financial ship, she has also recently lost her parents in a plane crash. She mentally checks out so often that Lars and the two neurotypical children have to take over, and she has a difficult time remembering anything, or believing that real life is actually true. In the checking out, though, lies the authorial brilliance. Swanson shows us how Kitty is repairing her broken heart in a contrived world where Frieda is still her soulmate, and her parents are still alive and able to show her love. And in this fake world, she is not a flailing autism mother, bereavement grief clashing with her efforts to find connection with her son, but a vibrant woman whose life in books begins to help teach a neighbor boy with a learning disability how to read. Eventually, Katharyn is able to find her way back and use what she made up to address the trauma from which she was withdrawing. It’s a beautiful and elaborate ending. How do we fix ourselves when our paths seem too horrifically difficult? We flee in our heads; dissociate; make motifs in our dreams. Every human being whose heart is shattered in some way does it. Swanson is very raw in showing how women very rarely get to go on physical furloughs, so we go on emotional walkabouts. We tell ourselves mythical tales of pain, loneliness, and strength. We howl for the dreams we have had to watch burn to the ground. And hopefully, prayerfully, we return to the embrace of the perfect ones who depend on our softness and endurance, and we house them in our gently beating hearts again. Swanson, Cynthia. The Bookseller. New York: Harper Collins, 2015. I love your blog entries, I look forward to reading every one. 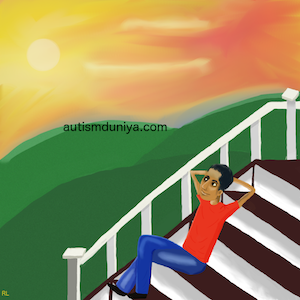 I am not the parent of an autistic child, but I have learned so much from these posts. I have known several autistic children ,and their parents and caregivers, too. But they did not express themselves in such a way that gave me insight, other than what I observed. Your writings are a view from the inside out, and I think that benefits everyone. Thank you so much, Jennifer. That means a lot. I loved how the book showed both things—that daily life as a caregiver pushes us hard; but the reason for the main character’s breakdown was not her child, but bereavement grief. And then caregiving became impossible. That is a very realistic depiction of the younger years. Older is a whole different thingy of wax!